Maman and I are anxiously awaiting your return home at vacation time. We have told the new neighbors of your talent and they look forward to a performance. And it will be the perfect time for you to meet the new director of our usine. He has treated your mother and the other secretaries most graciously and hints that he may have a position similar to theirs available for you after your graduation. How lucky for you to have such a stable and fitting opportunity to return home to after your years in Paris. And all the family working together! Don’t forget the souvenir for Lucille; you know how jealous she is that her sister gets to live in the city. When did I tell you I would spend my vacation at home? I did not. As a matter of fact, I cannot be away from the Conservatoire during the holiday; M. Enescu2has offered to give me three extra lessons during that time, which I cannot miss as I hope to audition for placement in orchestras in the next few months. I thank you for the opportunity at the factory, but as you know, my ambitions lie elsewhere. As for Lucille, she has no need to be jealous. She is a perfectly capable student and is sure to have an opportunity to attend university here if she applies herself. Tell Maman I send my regards. Ungrateful child! Is this all you have learned at the Conservatoire? To spurn your father who has done nothing but work to give you a comfortable life full of opportunity? It was I who saw your talent when you were a young girl, I who slaved away endless hours at the factory to pay for lessons to nurture that talent, I who entrusted you to the professors at the Conservatoire that you might enjoy a few more years of musical enrichment before you settle down with your own family. Did you think these things happened by magic? No! Only through the hard work of your mother and myself was the life you live possible. And in return you cannot give up five days of your time to visit your family and take advantage of yet another opportunity I have arranged for you? And the excuse born of frivolity! What reason do you have to take these auditions? It is a waste of your time! Can’t you see that orchestras are not a woman’s domain? I have never witnessed here in Viroflay a professional musical ensemble among whose ranks sat a woman performer, nor do I have any desire to. I only desire my eldest daughter to return safely to her home and to get on with her life. I do hope, though, that she’ll bring some common sense and gratitude home with her. I did not mean to offend you. Of course I am grateful for the opportunities you have given me. But they cease to be opportunities when you seek to control what I do with them. In my view, my studies at the Conservatoire do not have as their end my being a more attractive potential wife or a justification for you to brag about me to the neighbors and your chums at the factory. I came here to become an artist, and now I am ready to practice my art in the world. That is why I am taking these auditions. While it may be unheard of in Viroflay, public performances given by women performers, as well as concerts of new music by women composers are quite the common occurrence here in the city. The eminent music critic Emile Vuillermoz himself has written about women’s involvement in professional musical life in his article “Le Peril rose”: he seems rather afraid we’ll take the whole thing over and leave no room for the men! He wrote this in 1912, father. I think it’s high time you confronted the fact that it is possible and socially-acceptable for a woman to pursue a career in music. ‘Possible’ does not mean ‘appropriate’,’ easy’, or ‘advisable’. Even I, a man, and no less talented a musician than you when I was your age, realized the futility of pursuing a career as a pianist. How could I possibly have supported you, your sister, and your mother on the only sporadic engagements I would have found? Thank goodness I was sensible enough to listen to my own father and find a dependable job at the factory. Please come home (and down to earth first!) so that you can focus on securing a more reliable source of employment. We are counting on you: my job at the factory may be steady, but I myself will not last forever. Now I have proof! How fortunate that I stayed in Paris during the holiday. Last night I attended a concert the report of which I am sure will convince you to support my attempts at a career in music. A fellow violinist, Mme. Evrard attended the Paris Conservatoire just like yours truly–though she began her studies when she was only 12 years old! But this female conductor was not the only woman on stage: the entire orchestra was made up of women! I only wish you could hear the orchestra play! Please go, and tell Maman and Bernadette to join you there. You won’t regret it! It’s true: I was well-impressed to see an orchestra entirely filled with female instrumentalists. But you are right, my dear, her endeavor helps me imagine you performing in such an ensemble in the celebrated halls of Paris! Still, hers is only one example. Besides, what I would like most is to see you at all. When can you visit? Oh please, Pére! Would you really have been so concerned with the subtleties of Evrard’s movements if she were a male conductor? You remind me of the critics who, in reviewing the concerts led by Nadia Boulanger, have nothing to say beyond that outstanding musician’s appearance.13In any case, though Evrard leads the way for women performers like myself, every woman who embarks on this path must share her own unique talents and ideas. Surely I can benefit and learn from Evrard and her orchestra without becoming a robotic or “controlling” performer. And now–the best news–I may have a real chance to influence the performances Mme. Evrard leads: Evrard is officially organizing her ensemble as l’Orchestre feminin de Paris and is holding auditions within the month! The extra tutoring I received during the vacation is sure to pay off now. Wish me luck on my audition. Perhaps on my next visit I will be accompanied by 30 new orchestral friends! Although Ginette Neveu’s age, career, and familial circumstances do not align with many of the characteristics of the protagonist I present in these letters, I borrow Neveu’s name here as an example of another successful Parisian musician who also happened to be a woman. Ginette Neveu was born in Paris in 1919 to a musical family; she played her orchestral premiere at the age of seven, commenced her studies at the Paris Conservatory at age 11, and beat out David Oistrakh to win the International Wieniawski Competition in 1935 at the age of 15, an honor which initiated her international touring career. Neveu died in a plane crash in 1949 at the age of 30. 2 Oxford Music Online, s.v. “Neveu, Ginette,” Accessed 2 November, 2015. http://www.oxfordmusiconline.com/subscriber/article/grove/music/19801?q=Ginette+Neveu&search=quick&pos=1&_start=1#firsthit Ginette Neveu studied with George Enescu. 4 Oxford Music Online. “Canal, Marguerite,” accessed 5 October, 2015. http://www.oxfordmusiconline.com/subscriber/article/grove/music/04710?q=marguerite+canal&search=quick&pos=1&_start=1#firsthit. The dates are approximate: Canal taught at the Conservatoire for a year in 1919, then returned in 1932. 5 Oxford Music Online. “Long, Marguerite [Marie-Charlotte],” accessed 2 November, 2015. http://www.oxfordmusiconline.com/subscriber/article/grove/music/16948?q=Marguerite+Long&search=quick&pos=1&_start=1#firsthit. Long taught at the Conservatoire from 1906 to 1940. 6 Emile Vuillermoz, ‘Le Peril Rose’, Musica, 11 (1912), 45. Quoted in Laura Ann Hamer, “Musiciennes: Women Musicians in France during the Interwar Years, 1919-1939,” 183. PhD dissertation, Cardiff University, 2009. ProQuest U584377. 7 Hamer, “On the Conductor’s Podium,” 82-83. Evrard made her first appearance as conductor on 3 June, 1930 at the Salle d’lena. 8 Emile Vuillermoz: “Orchestre feminin de Jane Evrard,” L’Excelsior, 12 December 1932, 4. Quoted in Hamer, “On the Conductor’s Podium,” 83-84. “L’initiative prise par Jane Evrard, excellente violoniste, musicienne accomplie et travailleuse infatigable, est intelligente et raisonnee […]”Again, the dates are not exact: the letters are written in 1930, but Vuillermoz did not publish this review until 1932. 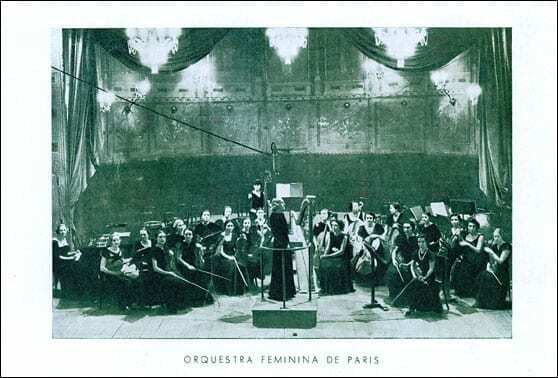 In fact, this was written after the official formation of the Orchestre feminin. At the June 3, 1930 concert that “Lucy” attended, the ensemble did not officially market itself as such. 9 Hamer, “On the Conductor’s Podium,” 85. 10 Hamer, “On the Conductor’s Podium,” 86-89. Though the pieces I’ve cited were not performed on the 3 June, 1930 concert, they were played by the Orchestre feminin during its existence. The pieces I mention represent two types of music that Evrard intentionally sought to promote: early French music, especially obscure and sometimes unpublished works written specifically for string orchestra, and new compositions written by French composers of the day. Evrard commissioned music by women composers such as Roesgen-Champion and Desportes, though apparently not in preference to music by male composers (89). (“Si nous n’allons plus a eux, c’est que maintenant, ils sont plus de 40.000 membres des jeunesses musicales qui vont assister aux plus grands concerts donnes actuellement soit a l’Opera, soit au Palais de Chaillot. Je voudrais realiser le meme miracle avec les ouvriers. Fatigues par une longue journee de labeur ils peuvent difficilement aller a la musique, aussi la musique doit elle les rejoindre sur le lieu meme de leur travail quotidien. La musique parle directement au coeur de l’homme, elle est la compagne de son bonheur et de sa tristesse, elle l’aide a vivre, a prendre connaissance de lui-meme, a mieux aimer les autres dont elle se rapproche, a mieux accomplir son devoir aussi. Elle introduit dans l’existence un element d’ordre et d’harmonie qui est un puissant facteur d’elevation spirituelle et de paix sociale”) (95). 12 Florent Schmitt, “Les Concerts,” review in Le Temps, 14 May 1932. Bibliotheque nationale de France, accessed October 5, 2015. http://gallica.bnf.fr/ark:/12148/bpt6k2487827/f3.item.r=jane%20evrard.zoom#. 13 Jeanice Brooks, “Noble et grande servante de la musique: Telling the Story of Nadia Boulanger’s Conducting Career,” The Journal of Musicology, 14 (1996), 94-95. Boulanger “burst onto the international conducting scene” in the 1930s (92), so it is plausible Ginette would have known Boulanger’s name in 1930. However, the review I am referencing here, an example of the many reviews that analyzed Boulanger’s physical appearance (which in fact deemphasized her femininity, in contrast to Evrard), appeared almost a decade later (1939), so Ginette would not have heard these exact words: “ Mlle Boulanger walked out onto yesterday’s stage with a flat-heeled, businesslike stride wearing a plainly cut black beaded dress and an air of quiet confidence, confirmed by a pair of austere nose glasses. Fiftyish, her hair is dark and streaked with gray. Her face is firm-lipped and resolute, but engagingly sweet and intelligent in expression” (95). 14 Emile Vuillermoz: “Orchestre feminin de Jane Evrard,” L’Excelsior, 12 December 1932, 4. Quoted in Hamer, “On the Conductor’s Podium,” 83-84 and Hamer, “Musiciennes,” 49-50.